This healthy Creamy Leek and Potato Soup with Garlic Parmesan Crostini is the ultimate fall comfort food. There’s nothing more comforting than a hot bowl of soup on a cold fall day. 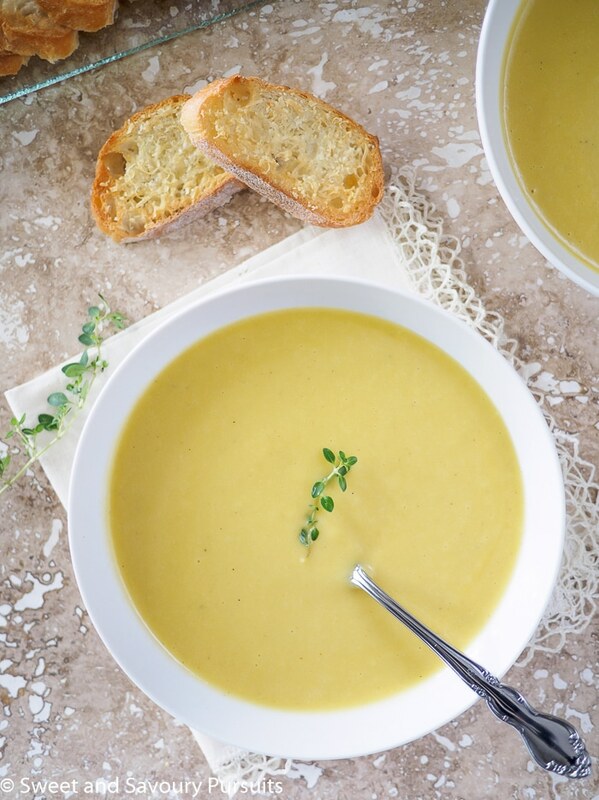 Leek and potato soup is a classic and there are many variations, but however you like yours, this soup is delicious and so easy to make. Since I received my new Vitamix I’ve been using it daily, I’ve made so many delicious things in it. Last week, I posted a recipe for Butternut Squash and White Bean Dip, I’ve also made a marbled butternut squash and chocolate loaf, that one disappeared before I even got to take pictures, so I’ll be making that again soon so I can share it with you. On warmer days, I even made some healthy fruity frozen treats. But this post is about this Creamy Leek and Potato Soup with Garlic Parmesan Crostini. I like my leek and potato soups creamy and with my Vitamix, I was able to get my soup silky smooth. And not a drop of cream or milk was needed to get this soup creamy, once blended, the potatoes in the soup make it ultra smooth. But this soup isn’t only healthy, it’s also hearty and tasty. Filled with veggies such as carrots, celery, leeks and potatoes, this soup has tons of flavour. Served with the Garlic Parmesan Crostini, this soup would make a wonderful first course at your Friendsgiving or Thanksgiving celebrations! If you haven’t already done so, it’s not too late to enter the Vitamix giveaway, click on this link to be directed to the right page. Contest is open to Canadian residents only. Good luck! (Contest is now closed). Note: This post is sponsored by Vitamix, I received a blender to create this recipe, but all opinions of their products are my own! 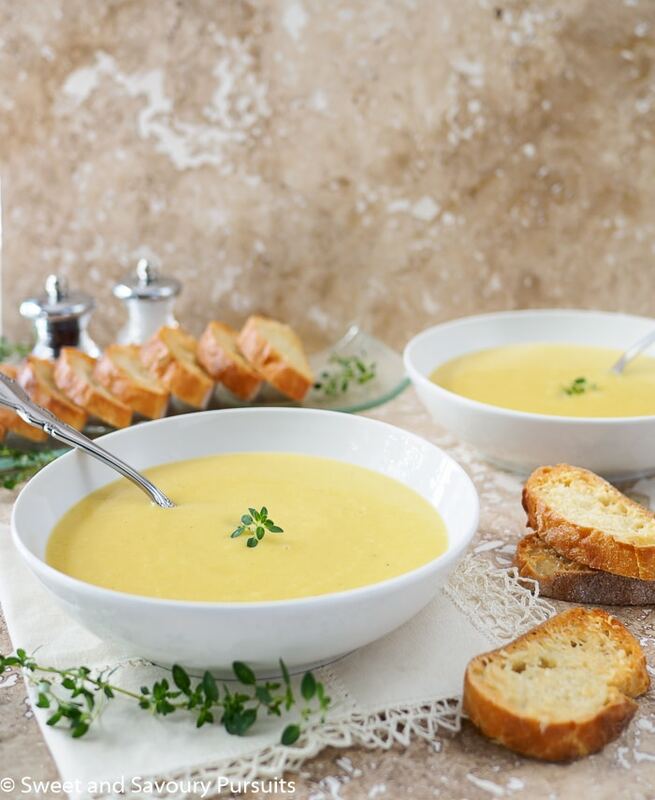 A silky smooth Creamy Leek and Potato Soup served with Garlic Parmesan Crostini. 4 lb. white potatoes peeled and diced, about 1.5 . Add the onion, leeks, carrots, celery and garlic. Season with salt, pepper and nutmeg. Lower heat to medium and cook, stirring every few minutes, until vegetables soften, about 8 to 10 minutes. Add the potatoes and 8 cups of stock, bring to a boil and then reduce heat. Simmer soup until potatoes are tender, about 20 minutes. Adjust seasonings, let soup cool slightly. Remove the thyme sprig before pureeing soup in batches in your Vitamix, or other blender. If you prefer you could purée only part of the soup, so that you have a chunkier textured soup. I love potato soups and there are so many great ingredients in this recipe–it sounds wonderful! My mom used to make potato and leek soup and I always loved it! Sadly, I don’t think I’ve had it since I was a kid – that has to change! This looks just spectacular and paired with the garlic parm crostini, to die for! Must make this! That is a Winter warmer right there. Love the idea of serving it with garlicky crostini! Just lovely Fida. The soup sounds so good and the garlic parmesan crostini sounds wonderful! Thank you Nancy! I have to say, I love dipping the crostini in the soup, it’s so good! This looks so pretty. 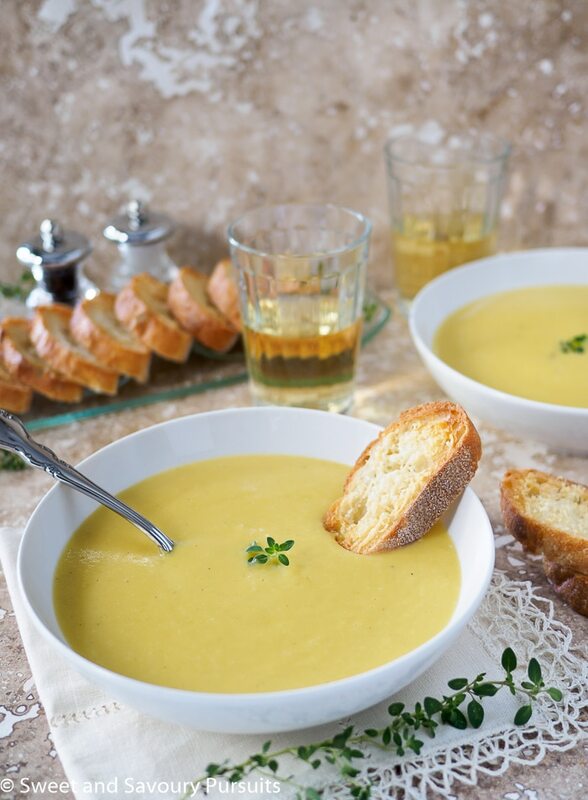 I love leek and potato soup, and the cheesy crostini would go with it perfectly! Thanks Louise, I find thyme always looks so nice in pictures, and dipping the crostini in the soup is the best part! This soup looks so delicious.